Breakfast has long been known as the most important meal of the day. It's what fuels a body to make it through a long day at school folllowed by tutoring, sports practice, homework, studying and more! For that reason, consuming a healthy, nutritious meal in the morning is one of the most important things a child does each day. Research has repeatedly proven that a healthy breakfast positively impacts brain function and energy level, which is extremely important for school-aged children. With as many standrardized tests, college entrance exams and homework assignments that they are expected to complete now at school, they need fuel to help them remain alert and make it through hours of work. Benefits of breakfast There are many benefits to eating breakfast and many reasons why parents should make eating breakfast a top priority for their children Breakfast equals better behavior. Children who skip breakfast are more tired, irritable, or restless by late morning. These symptoms lead to aggressive behavior that causes children to get in trouble in school. Schools already have enough discipline problems to deal with between gangs and Children who regularly eat a morning meal have more energy, are less likely to exhibit aggressive behavior, and have a better attitude toward school. Higher Test Scores Eating a healthy breakfast also leads to higher test scores amongst school aged children. A study published in 1998 in the Archives of Pediatrics and Adolescent Medicine showed significantly higher math test scores after children ate breakfast. This and other research has clearly shown that children who consistently eat breakfast test higher in most academic areas. They are more alert and more prepared to endure the testing process. 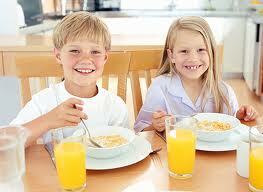 Better Attendance Eating breakfast has also been shown to lead to better class attendance. Children who eat breakfast are absent from school fewer days a year than children who miss this important morning meal. They also spend less time in the nurse's office complaining of stomach pains. The irony falls in the excuse most parents give for not giving their kids breakfast. Most say that they are too rushed or don't have time for breakfast. This contradicts itself, however, since children who claim they don't eat breakfast due to a lack of time in the morning are tardy more often than those who take time for a morning meal. Healthy Eating All Day Eating breakfast in the morning also leads children to eat healthier the rest of the day. They are not starving by the first break and aren't reaching for the first bag of candy or chips they see in the school vending machine. In addition, they generally meet vitamin and mineral requirements for prevention of deficiencies. They consume more fiber, vitamin C, calcium and folic acid. Unfortunately, children who miss breakfast do not make up for lost nutrients later in the day. Weight Control Eating breakfast also helps weight control. With the rising child obesity rate today, it's even more important to make sure children are well fed and eat a healthy breakfast every morning. Eating breakfast helps to establish a normal eating pattern. Eating regular meals and snacks is a key to maintaining a healthy weight throughout life. Increasing childhood obesity is in part attributed to the disappearance of normal eating patterns in many of today's households. So, not sure what to give your child for breakfast? Don't think you have time? Try some of my favorite choices for a healthy breakfast. They're suitable for children & adults by adjusting the serving sizes. 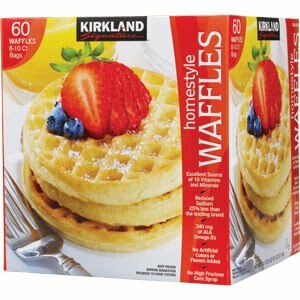 These waffles are delicious, nutritious, inexpensive and easy to serve! What more could you want in a breakfast food. If you want to, you can hand it to your child on his or her way out the door and they can eat it as they would a piece of toast! Kirkland Signature Waffles are an excellent source of 10 vitamins & minerals, including 460 g of ALA Omega-3s, 25% less sodium than the leading brands, no artificial colors or flavors, no high fructose corn syrup and only $ .30 per serving at only $7.94 for 60 waffles! I usually serve them with fruit (cantalope, honeydew, apples, orange slices, strawberries) & half a yogurt so my daughter gets fruit & dairy servings along with healthy carbohydrates.